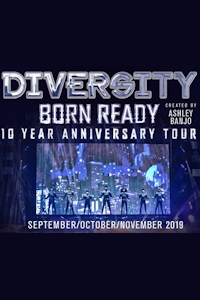 Diversity - Born Ready tickets at Waterside Theatre, Aylesbury. 2019. Find the best Diversity - Born Ready dance or ballet tickets at Waterside Theatre, Aylesbury. Formed in 2007, in memory of a dear friend, the dance troupe consists of eleven members from East London and the Essex area. Diversity are really one big family. They are made up of three sets of brothers: Ashley and Jordan Banjo, Ian, Jamie and Matthew McNaughton, Sam and Mitchell Craske. They are complemented by four of their best friends: Terry Smith, Ike Ezekwugo, Warren Russell and Perri Luc Kiely. 10th Anniversary Tour. Diversity - Born Ready tickets: The tabs above allow you to select between links to suppliers and date searching. Click on a supplier's logo to see their details and on the 'buy now' button to see and check the tickets on offer.